Many of these preference decisions align with what I said last week, but there are some surprises. Here is the spreadsheet I produced when I was making this analysis, showing the main preference decisions for the bigger parties in each seat, plus Labor upper house preferences. Firstly, Labor is doing much better than the Coalition with lower house preferences from minor parties. Keep Sydney Open are preferencing Labor ahead of the Coalition in the 41 seats where they lodged how-to-votes (sorry Murray). They are putting the Greens ahead of Labor in the three Greens seats. Animal Justice are exhausting in three seats and did not register a how-to-vote in one seat. They are preferencing Labor ahead of the Coalition in 44 seats. Interestingly they are preferencing Labor ahead of the Greens in Ballina. The big story of the last few days has been the claims that the Shooters, Fishers and Farmers have done a preference deal with Labor. This seems more likely with SFF preferencing Labor in numerous seats. SFF are preferencing Labor over the Coalition in 16 seats, and exhausting in eight seats. In one other seat they have registered both options. There are some interesting races where SFF is not preferencing Labor, in particular Upper Hunter, but there are a series of other Labor marginals (mostly on the outskirts of Sydney) where they are giving preferences. The Christian Democrats are preferencing the Liberal Party in every seat they run in, while One Nation is not preferencing a major party in any race. The Australian Conservatives preference the Coalition in a number of seats but also favour the independent in Dubbo. The Liberal Democrats preference the Coalition before Labor in every seat, and in most cases in front of other viable challengers. The only variation is in Wollondilly, where they put local mayor Judy Hannan above the Liberal candidate. The Greens have registered how-to-votes preferencing Labor over the Coalition in all 93 seats, but in three seats (Coogee, Heathcote and Tweed) they also registered a ‘just vote 1’ how-to-vote. This could be a sign that preference negotiations with Labor are still ongoing, or could have been an insurance policy in case a deal broke down. The Liberals and Nationals suggest a ‘just vote 1’ in almost every seat, but they do preference independents in Bankstown, Cabramatta, Lake Macquarie, Maroubra and Sydney, and the Nationals in Orange preference a couple of minor parties. I was actually fascinated by Labor’s how-to-votes, to the extent that it motivated me to do a map. It seems like Labor is trying to achieve very different things in different seats. Labor is preferencing the Greens second in places where the Greens can win. They are preferencing the Shooters in a good position in Cootamundra, Orange and Barwon. In Murray they have registered two how-to-votes – one preferences the Shooters, and the other exhausts. They have also put the Shooters ahead of independents in Dubbo and Wagga Wagga. Overall, Labor has varied widely in terms of whether they mark every preference on the lower house ballot, recommend a partial numbering, or just recommend a ‘1’ only vote. I count 44 seats where they recommend full preferences, 27 seats where they exhaust, and 18 where they recommend partial preferences. This doesn’t include four seats where they have registered an exhausting how-to-vote and one that marks some or all preferences: Heathcote, Murray, Newcastle and Upper Hunter. 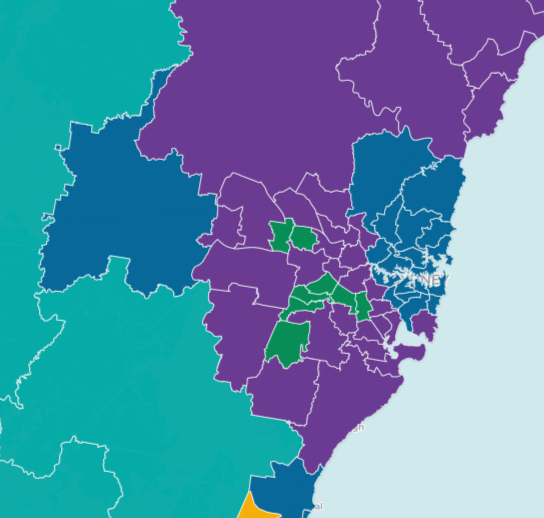 I have plotted out these decisions on the map below (if you toggle), but in summary I have found quite a few seats in western Sydney where the ALP is actively encouraging voters to ‘just vote 1’. This seems puzzling considering these are places with high rates of informal voting at federal elections, and we are less than two months away from such an election. I’ll return to the topic of Just Vote 1 later this week. The core of their how-to-vote is a #2 vote for the Greens and a #3 vote for Animal Justice. In urban seats they have listed Keep Sydney Open as #4. In rural seats they have instead listed Angela Vithoulkas’ Small Business Party, which is ironic considering she also hails from the City of Sydney and her small business is on George St. They have then added a fifth preference for the Voluntary Euthanasia Party in a certain type of urban seat – those that are likely to be more socially progressive. This includes all of northern Sydney, the eastern suburbs, the inner west and the seats of Newcastle and Wollongong. Labor then adds a fifth preference for Jeremy Buckingham in a handful of rural electorates in western NSW and the north coast. This pattern applies in almost every seat, with only a few exceptions. Keep Sydney Open get a preference instead of Small Business Party in Ballina. In Lismore they have registered an urban-style how-to-vote preferencing Keep Sydney Open and a rural-style how-to-vote preferencing Small Business and Buckingham. Possibly this is keeping their options open, or reflects different how-to-votes in different parts of the seat. And then there is a string of eight seats in western Sydney (stretching from Macquarie Fields to Lakemba and also covering two seats in the Blacktown area) where Labor has registered an alternate how-to-vote with no preference for the Greens. They’ve done the same in Cessnock. I can’t say what Labor’s motivation is for doing these different preferences. It may be an attempt to boost a number of potential upper house allies in the seats where voters are most likely to follow them, or it may be an attempt to avoid alienating voters in particular areas. This How to Vote Nationals and Liberals is interesting. The Liberal Democrats are returning the favour. Here is the Liberal Democrats firearms policy? Yesterday Gladys spent most of the day being outraged about preference deals with parties that want to weaken gun control laws. I look forward to Gladys explaining why her coalition has done a preference deal with the party that was to remove restrictions on semi-automatic weapons and allow children to have guns. Funny thing about Greens registering a 1-only HTV in Coogee is that was one of the very few seats where they actually preferenced Labor in 2011. WW – I noticed this too after seeing Lleyonhelm on Twitter yesterday boasting about how he was more extreme than SFF on guns – particularly ghastly after last week! If I were in Daley’s campaign team (which I’m not btw) I’d be looking to skewer Gladys on this for sure. GREAT ARTICLE……………..What about Substainable Living ……… (LABOR)?????? FACEBOOK …… Stephen FARROW.